The man can see that Tyreese is a good man, and warns Tyreese that if he doesn’t take Judith and leave now, they will end up dead. Carol gets as far as the fence of Terminus (thanks to a zombie blood mud bath) and sees Rick and the others being dragged away from the shipping container. She manages to blow up a propane tank, causing a huge distraction, as well as simultaneously killing walkers and letting even more into Terminus. The explosion distracts Tyreese, and the man has taken Judith, threatening to break her neck if Tyreese doesn’t go outside, where there are now walkers surrounding the building they are holed up in. There is a ton of commotion, and then quiet. Tyreese busts through the door and tackles the man, and then proceeds to beat the man to death. Back at Terminus, Rick has freed himself with a sliver of wood he hid in his jeans. He kills the two muscle men, who were arguing about whether or not to see what is going on outside. Rick, Bob, Daryl and Glenn head outside, and try to devise a plan. Carol has snuck into Terminus in her zombie “costume” and begins roaming the grounds. She finds a weird/sacred circle with candles and names drawn on the floor. A woman (the one who greeted the others when they arrived) attacks Carol. The woman explains how Terminus used to be a sanctuary until it was taken over by bad people. They managed to take their settlement back, and if you aren’t the butcher then you are the cattle. Carol shoots her in the leg, and opens the door, letting the walkers have at her. Rick jumps into action, stealing a Terminan’s gun, and using it to kill all the Terminans that he sees. They manage to free the other from the container, and they fight their way out of Terminus, killing as many human and zombie foes as possible. There’s definitely a lot more blood and gore this season, and I know that seems like a weird thing to say about a zombie show. The bite/kills are way more graphic, and there’s more internal organs and things like that. I don’t mind it personally, but I can imagine there would be some that might be turned off by it. I wonder if it’s sort of a compromise to quiet the people who think the show has gotten too stale and boring. As everyone regroups on the woods, Rick finds the stash of guns and wants to go back and finish off everyone at Terminus. The others feel it’s too dangerous, plus with all the walkers, anyone left is as good as dead anyway. That’s when Carol emerges from the woods. 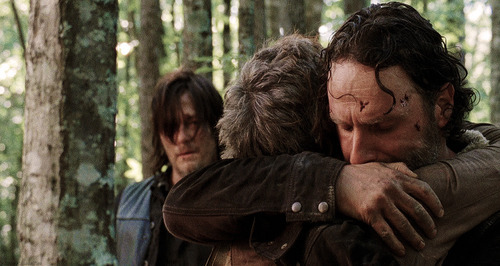 Daryl runs to her and they embrace. Rick hugs her and asks her if she did all that (the explosion). She says yes and then says she has something to show them. She brings them back to the shack where Tyreese and Judith are waiting. Rick and Carl run to Judith, and Sasha runs to Tyreese. Tyreese tells Carol he had to kill the man, and she looks impressed. Tyreese still looks scared and a bit distraught. As they leave for better places (or at least places that aren’t burning forests), Rick stops to change the Terminus sign to No Sanctuary.